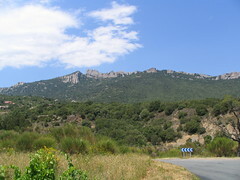 I rode from Rennes les Bains to Perpignan, and it was HOT. 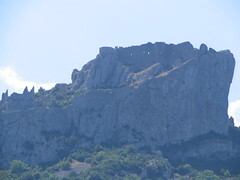 Can you see the castle in this photo? I probably wouldn’t have noticed it if it wasn’t for the flag. 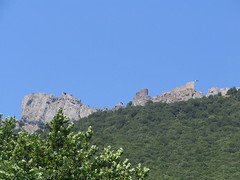 The Cathares built their castles out of local stone to camouflage them. 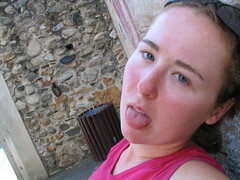 I was sooo hot and tired, this was about 25 k outside of Perpignan, and I was ready for the day to be done. 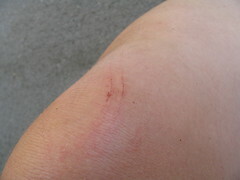 hahah oh and that morning, I cut myself on a baguette. How are these ridiculous injuries possible? next up, I lose a toenail due to a cucumber. « Why would I ever want to come back to NY?